It’s a simple meteorological process, but it’s surprisingly unpredictable. The 2015–16 winter was the warmest on record, and that threw the whole system out of whack. California saw more snow than it had in a long time, but it saw rainstorms too. A few resorts in the East never opened for the season. It’s increasingly difficult to believe that winter won’t keep getting weirder—wetter in some places, hotter in others. For skiers, that means the Pacific Northwest might be sunny in February or the Rockies could be rainy in December. The future of snow is up in the air. We know from the past few winters that there’s no new normal. The pendulum between a good season and a mediocre one swings hard and fast. And non-normal seasons will happen more frequently. So how do we look forward to snow in a warmer, wetter, weirder future? The resorts are mobilizing. There are tarps stretched across glaciers in France’s Grands Montets, more-efficient snowmaking systems being installed every winter, a widespread push to reduce carbon footprints, and much more. And meanwhile, to keep snow on the ground and keep skiers coming back, resorts have had to adapt. These dispatches from the field illustrate some of the good work being done—and what still needs to happen. First thing in the morning, before he’s even left his house, Barrett Burghard, director of snow surfaces at Heavenly Ski Resort, checks his phone. He taps into the SmartSnow app, which was built by snow-gun company SMI, and opens a map of all the snowmaking machines on the mountain. From his phone he can check the temperature and humidity, turn up the water pressure, and turn guns on and off. It used to take a crew of snowmakers on a night shift snowmobiling around to check the hoses and adjust the guns. Now there’s an app for that. One of Heavenly, California&apos;s high-efficiency snow guns can cost $40,000. The Heavenly snowmaking arsenal is one of the biggest in the business: 200 snow guns (90 of them fully automatic fan guns), 20,000 feet of pipe, and four pump houses, two each in California and Nevada. They have the capability to make snow on 73 percent of the ski hill, and they’re aimed to do it in the most targeted, technologically advanced way possible. But making snow, especially in warm, wet California, is a tricky alchemy. It makes sense only in a narrow temperature range, and it’s harder to make snow when it’s humid. So Heavenly’s trying to use weather monitoring and automation to its advantage. Burghard, who has made snow for 25 years, spends a lot of time considering the snow flake. What temperature and humidity make the best crystals? At what wind speed does it become inefficient to run guns? How long do you have to wait to run a snowcat over newly blown snow? Too soon, and the tiny bead of water inside each flake will burst, turning it all to ice. Too late and the morning crowds are cranky, vowing to go somewhere else next time. Snowmaking is finicky, and the variables can make a huge difference in the snow quality, which is why having the technology to know all of your variables, and then control for all those variables, is a boon. you can see how deep it is.” The software, which is put out by the Pisten Bully snowcat company, claims to cut snowmaking needs by 15 percent, conserving energy and cutting costs. Heavenly snowmaking techs consult the SmartSnow software for a status report. Heavenly’s system has allowed the resort to stay open in marginal, snow–free conditions. Over the past few seasons, when California has been in the grips of drought, it’s still been able to spin lifts when other ski areas closed, although Burghard says it had to make snow all last season, and it couldn’t cover all the runs because of temperature and weather constraints. And as much as the machines help, they’re not a miracle cure; temperature is the ultimate driver. “Mother Nature can make snow at 34 degrees, but we can’t,” Burghard says. We&apos;re calling last year a throw-away year," says Jeff Temple, director of mountain operations at Vermont’s Killington Mountain. He’s joking, sort of. He says last winter was the worst one he can remember. Most of February was above freezing at the mountain. They got 76 inches of natural snow. Total. a testament to the mountain’s creative and motivated snowmaking team. Snowmaking on Superstar, home to the World Cup races in late 2016.
don’t leak, to big ones, like switching your operation to renewable energy. And Killington is doing all those things, or at least a lot of them, hoping to keep skiing going from November to April well into the future. make wetter, denser snow, to blow a solid base that ski edges won’t rip through down to the grass. Then they’ll bring in the low-energy guns to make a lighter, fluffier, carveable layer on top. The surface feel and how it skis are important to them. Those perfect layers can be hard to get because so much depends on the weather, but the team’s constantly trying, learning a lot along the way. Renewable energy in the form of methane—dubbed Cow Power—has become a go-to initiative at Killington. So despite the challenges, Killington is pressing on. 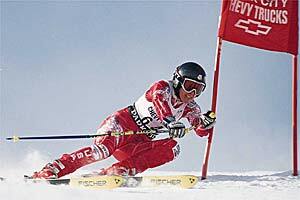 It committed to hosting early-season World Cup races after Thanksgiving, the Eastern U.S.’s first since 1991. Temple says no one really wanted to host it, because it’s hard to promise enough snow to run a race that early in the season. Last season races were canceled in Finland, Germany, Croatia, and Austria because of lack of snow. “That’s a warm time of year worldwide these days. Nobody wants that early-season date,” he says. But Killington signed up because it’s con dent in its ability to put snow on the hill, to eke out a skiable surface from every bit of moisture and every night of low temperatures. Temple will see to that. The problem at Arizona Snowbowl starts with the geology. The ski area, which opened in 1938, sits at 11,500 feet in the volcanic San Francisco Peaks north of Flagstaff. The igneous rock of the mountain doesn’t hold water. There are no streams or lakes, which means there’s nowhere to draw water for snowmaking. The snowcapped San Francisco Peaks, home to Arizona Snowbowl. or recycled, water is wastewater that’s been treated to remove impurities and pollutants. Flagstaff was already using reclaimed water, which is treated to a standard just below drinking water, to irrigate parks and golf courses, and much of that water wasn’t being used in the winter. held extensive protests. Diné member Klee Benally chained himself to a backhoe. He called the project cultural genocide. But after years of protests, lawsuits, and environmental reviews, the ski area won the right to use the water in 2010. The U.S. Forest Service did an extensive environmental impact statement and concluded that the water, which is treated to a “class A” standard, wouldn’t damage the ecosystem. The Arizona Department of Environmental Quality signed on to test and monitor the water, and the Environmental Protection Agency signed off on its use. The state legislature had to change the statutes governing reclaimed water to include snowmaking, but the move to make snow out of treated water eventually passed. A view of Humphreys Peak, the highest in Arizona at 12,643 feet. The resort&apos;s base sits at 11,500 feet. When Snowbowl got the go-ahead, it built a holding pond at the base of the mountain and a 14-mile pipeline from town, and it got access to 1.5 billion gallons of water a day—an amount that has been called wasteful by groups like Friends of Flagstaff’s Future. In December of 2012 Snowbowl became the first ski area in the country to use reclaimed water for snowmaking. The idea of recycled water triggers an ick factor in a lot of people, but effectively all water on earth is recycled, just to different standards of cleanliness. Cities in California and Texas, where droughts have been getting worse, are treating wastewater for drinking, with no ill effects on health. The water Snowbowl pumps out of its snow guns is tested by both the federal government and the state, and they say it’s not a health risk. There’s still concern from environmental and tribal groups that some of the chemicals not included in the government tests, like endocrine disruptors, could cause ecological harm, but the authorities have repeatedly said there’s no risk. Like most manmade snow, it seeps back down into the aquifer, and snowmaking is considered a non-consumptive use. As CEO of Vail Resorts, which owns Vail, Beaver Creek, Breckenridge, Heavenly, Northstar and other properties and ventures, Rob Katz oversees one of the largest and most sophisticated ski-resort operations in the world. He seemed like an appropriate expert on the subject. The organization aims to educate the outdoor community on climate-friendly candidates in upcoming congressional races. Chris Steinkamp has grown Protect Our Winters into the ski industry’s leading voice for climate action. His next challenge: convincing skiers to spark a movement to save the snow—and bag some turns. Check out a video of new snow from October 4.